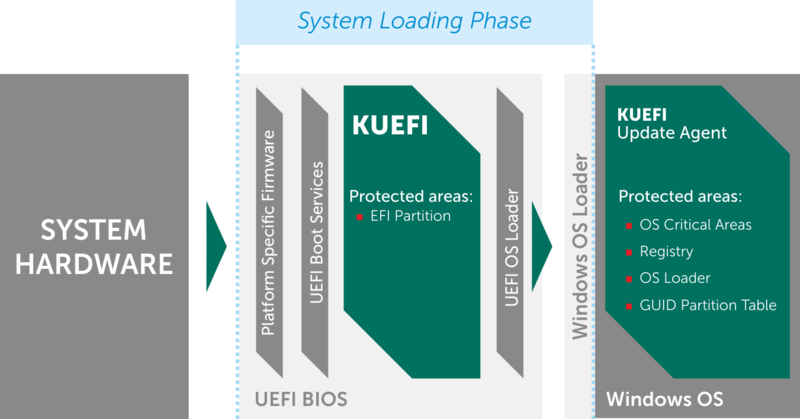 Kaspersky Anti-Virus for UEFI (KUEFI) is the EFI BIOS level endpoint security solution providing effective protection from rootkits and bootkits and ensuring safe OS loading. The product's key feature is that it starts running in the EFI environment even before the OS boot up process begins, thus preventing any resident malware from loading. By working on EFI level, KUEFI ensures reliable protection from rootkits, bootkits and other malware speciﬁcally designed to circumvent desktop anti-malware technologies. KUEFI is provided as a small EFI module which contains the award-winning Kaspersky Anti-Virus engine. The KUEFI architecture enables its integration into any motherboard ﬁrmware supporting the EFI standard, regardless of the vendor. When deployed on-chip, KUEFI is always on, ensuring safe OS boot up process. Thus, KUEFI integration with hardware makes it possible to meet the stricter security requirements in place in industrial and governmental institutions. Designed especially for ﬁghting complex malware, such as rootkits and bootkits capable of subverting desktop anti-malware protection. Based on the award-winning Kaspersky Anti-Virus engine. Thanks to motherboard ﬁrmware integration, cannot be deactivated by malware or unauthorized user. Supports the modern families of Windows and Linux operating systems. To reduce OS boot up time, scans only system critical areas: EFI, GUID Partition Table, OS loader and core, key OS ﬁles, Windows registry, and a few others. Provides ﬂexible settings which can be used to set up the optimum trade-off between performance and scanning depth as required by each customer. Doesn't conﬂict with desktop anti-malware solutions. Uses cutting-edge detection methods, including static and dynamic (i.e., emulator-based) detection. Scanning module can be updated during a routine update of anti-malware bases. Scanning module size of less than 1 MB. If you wish to know more, please click the CONTACT US button below and indicate that you require more information about Kaspersky Anti-Virus for UEFI, and our representative will get in touch with you shortly.